“A Russian Journal” was published 65 years ago, but it is the arguably among the most honest foreign reporting for its keen powers of observation, droll humor and sheer lack of conclusion about the place. The duo was far from their aristocratic room at the elegant Metropole Hotel in Moscow where they had begun their trip. During their time in Stalingrad, they became intensely fascinated by the resurrection of life among the ruins. The place was still horrifically gutted two years after the war, but it was far from deserted, they found. Stalingrad was a large city, and people had gone back to life and work. “Underneath the rubble there were cellars and holes, and in these holes many people lived. We would watch out of the windows of our room, and from behind a slightly larger pile of rubble would suddenly appear a girl, going to work in the morning, putting the last little touches to her hair with a comb. She would be dressed neatly. How they [the women] could live underground and still keep clean and proud and feminine we had no idea. …It was a strange and heroic travesty on modern living,” Steinbeck observed. Capa and Steinbeck had both covered World War II as journalists and they both had seen and endured a great deal. Their journey through Russia moved them so deeply that their diary of the trip is by turns funny, poignant,shocking and even, considering their heft as major chroniclers of the 20th century, at times naive. In between chapters six and seven there is a short rant by Capa, called “A Legitimate Complaint.” The photojournalist complains in a brotherly way, about Steinbeck’s habits as a reveler and a drinker. For a glimpse into the daily habits of the author of “The Grapes of Wrath” and “Of Mice and Men,” the scene is unsurpassed with wry humor. Steinbeck and Capa also spent a great deal of time with farmers and their families in the wheat fields, and their witness to this intense work and collective organizational system is one of a kind. Not many outsiders spent time in the fields. 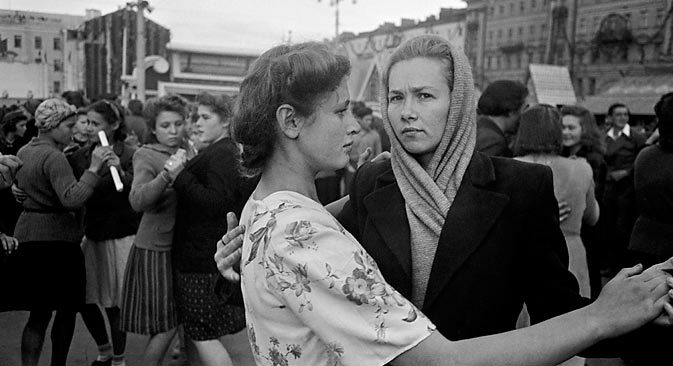 Capa’s photos give the reader the majesty of the experience. Published two years after Winston Churchill first used the term “Iron Curtain,” “A Russian Journal” was an attempt at “honest reporting without drawing conclusions,” as Steinbeck put it, a form of journalism both liberating and true.